If you are reading this, then you are a parent or a grandparent in Chicago who is thinking about finding the best possible school for your little one. There are so many options in Chicago testing that it can sometimes feel overwhelming, especially if your child is just 4-years-old! Even if your child is older, it’s still a complicated process to understand. Maybe you are fortunate enough to live in an area where your designated neighborhood school is great. Perhaps you are thinking of sending your child to one of Chicago’s prestigious private elementary schools or you want to consider the options offered through the Chicago Public Schools (CPS). The Chicago Public School system is one of the largest school districts in the United States and there are many elementary school options to consider. In addition to general education programs, CPS offers magnet and magnet cluster schools (special emphasis on a topic area such as Fine Arts or Math & Science), along with charter (privately run), and Regional Gifted Centers and Classical Schools (academically advanced). At www.TestingMom.com, we can advise you about the many school choices available in Chicago and provide you with resources to help you prepare for various admissions tests. 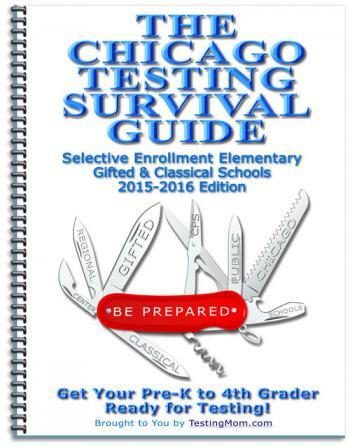 In this ebook, we will focus on the Selective Enrollment Elementary Schools (SEES) of the Chicago Public Schools (CPS); specifically, the Regional Gifted Centers (RGCs) and Classical Schools, which you should consider if you are seeking a “free” academically advanced curriculum for your gifted child. We will provide you with a general overview of the RGCs and Classical Schools as well as the application and testing process. In this ebook, you will also find some sample test prep practice questions from our website, as well as resources on recommended Chicago-based companies that can further assist you with navigating the SEES admissions process, assessing your child’s critical thinking skills, or finding a tutor to help your little one prepare for his or her first gifted admissions test.